And you know what? Exactly a month from now, I'll be celebrating my 24th birthday!! Hurray! Really, I'm not getting any younger. I just feel so grateful for all the blessings that God has graciously poured on me.I can't say that life is smooth, but I manage to surpass the bumps along the road. Thanks to God and to His angels called friends and of course to my family. So, in celebration of this wonderful life, and in gratitude to those who constantly drop by - reading and checking out this blog, I am giving away complimentary tokens from Tom's World! 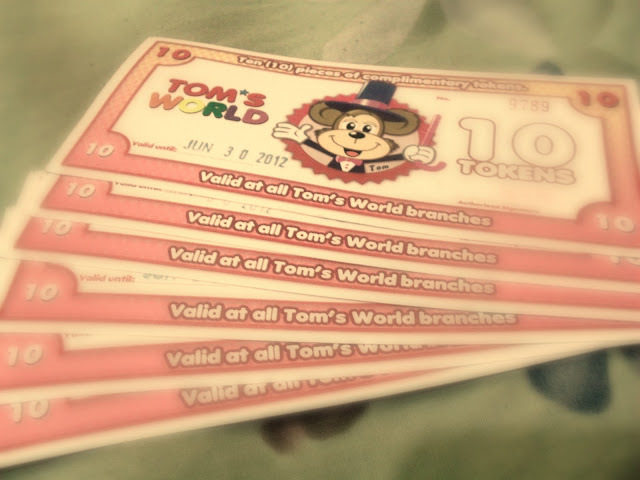 The winner will get not only one but twelve GCs from Tom's World which totals to 120 tokens valid until June 30, 2012 at all Tom's World branches. Use rafflecopter for your entries. The only mandatory thing that you need to do is to leave a comment. If you do so, you can add four more entries to increase your chances of winning. You can like my Facebook Page. You can share this blogpost on your Facebook wall. You can tweet about this blogpost. If you do all, you'd have 5 entries to this giveaway! Very easy! Please take note that this giveaway is only open for Metro Manila residents since most Tom's World branches are here. But if you are in the provinces and would like to send these as a gift to anyone you know who is a resident of Metro Manila, please do join! If you win, just let me know who to send these tokens to. Contest ends on the 16th! If you want to win, please leave a comment. :) thanks!